The purpose of this study was to examine the effects of a therapy dog on agitation and socialization in persons with Alzheimer's disease (AD) or related disorders who display behaviors consistent with sundown syndrome. A secondary purpose was to determine if changes in agitation and socialization were related to the level of dementia. The Alzheimer's Association has estimated that 4 million people have AD, and by 2050, that number will increase to an estimated 14 million (Alzheimer's Association, 1998). AD is a slow, progressive, neurological disorder that leads to cognitive dysfunction manifested by impairments in memory, reasoning, abstraction, and personality (Manor, 1991). Although AD is primarily a disease affecting the elderly, it has been diagnosed in younger people (Alzheimer's Association, 1998). AD's cause is unknown, but the presence of diffuse amyloid plaques and neuritic tangles in the brain is considered a hallmark of the disease (Shapira, 1994). Aggregation and precipitation of these insoluble amyloid plaques in brain tissue and blood vessels lead to cognitive impairment. The plaques and tangles in the brain disrupt normal brain activity, causing a progressive decline in cognitive and perceptual functioning. As a consequence of these changes, the person with AD may exhibit a variety of problem behaviors. For some persons, these behaviors occur with increased frequency in the late-afternoon hours. This period of time is clinically referred to as sundown syndrome. Sundown syndrome is yet to be used as a diagnosis, but it is a common and recognizable phenomenon for those who provide care for people with AD. Causes of sundown syndrome are most likely multifactorial. Orientation seems to be disrupted by the dim light and other changes that sundown brings in the sensory environment (Paiva, 1990). Key factors signaling the potential for sundown syndrome include advanced age; dementia, or other organic brain syndromes already present; poor vision; hearing deficits; dehydration with electrolyte imbalances; adverse medication reactions; and fatigue. Behavioral changes of sundown syndrome include increased restlessness and verbal behavior (Evans, 1987); confusion; aimless wandering; paranoia; agitation; and aggressive behavior, such as hitting, kicking, and biting directed toward staff, family, or other patients - all of which occur during evening hours. Agitated patients often become uncooperative with evening routines, making management of their care difficult for health care staff. Aggressive behaviors may lead to alienation, loneliness, and fear, and ultimately may result in increased aggressiveness. Currently, no known cure or treatment interrupts or reverses the pathological changes associated with AD. Research is underway to determine the effects of a variety of nonpharmacologic interventions to manage behavioral symptoms that present with this disease. Finding ways to decrease agitation and associated responses that others have toward the person who displays agitated behavior presents a challenge to care providers. The very nature of agitated behavior places persons who manifest them at risk for social isolation. It has been demonstrated that social interaction is needed by persons with AD who have lost the ability to initiate relationships with others (Kongable, Buckwalter, & Stolley, 1989). Companion animals have been used in health care settings to "reach" individuals who have a reduced capacity to interact with others. Pets provide affection and companionship not contingent on cognitive or physical capacity (Kongable et al., 1989, Wilson & Turner, 1998). Therapy animals have been successful in a variety of settings in reducing stress and providing companionship. Therapy dogs may produce positive effects with the elderly through several mechanisms. One is by inducing relaxation. Interacting with a dog has been shown to have relaxing effects as evidenced by decreased blood pressure and increased peripheral skin temperature in a variety of settings (Baun, Getting, & Bergstrom, 1991). Distraction is another potential mechanism by which the presence of a therapy dog could benefit people with AD or a related disorder. During sundown syndrome, a therapy dog may stimulate reminiscence and memories, thereby distracting them from displays of agitation. Families often find it necessary to institutionalize their loved ones as AD progresses because of the increased mental deterioration and agitation. Frequent visitation may not be possible for the family, and staff members are limited in the amount of time they can spend with each individual resident. As a result, people with AD or a related disorder may experience a loss of personalifed affection. It matters little to a pet if the person's body has deteriorated or if the same stories are repeated over and over (Manor, 1991). Therefore, the therapy dog can provide the missed physical contact by allowing petting, kissing, and hugging. Several previous studies have demonstrated beneficial effects of pets for persons with AD. The presence of a pet in the home reduced display of agitation and aggressive behaviors (Fritz, Farver, Kass, & Hart, 1995). In an experimental study conducted in an AD special-care unit, the presence of a therapy dog increased the total number of socialization behaviors of persons with AD during one-on-one interaction (Batson, McCabe, Baun, & Wilson, 1998). This study was designed to investigate the effects of the presence of a therapy dog in a natural setting, such as the common area of an AD special-care unit. It follows and builds on a previous study (Batson et al., 1998), which showed that the presence of a therapy dog with individual persons with AD or a related disorder increased socialization behaviors. An experimental within-subject repeated-measures design was used for this study. The subjects were videotaped under two random ordered conditions both with and without the dog present. The research project was approved through the Institutional Review Board and the Institutional Animal Care and Use Committee. Subject eligibility criteria included a diagnosis of AD or a related disorder, residence in a special-care unit, demonstration of agitated behavior in the evening hours, no allergies to dogs or bad experiences with them, consent from the legally authorized representative, and assent from the subject. Three Midwestern extended care facilities with special-care units for persons with AD or a related disorder were the study sites. Each facility had 20 to 35 residents on the unit, and each unit had a common area (lounge) where residents congregated for the day. Demographic data collected included subject's age, gender, ethnic background, diagnoses, medications, and months residing on the special-care unit. The severity of dementia was measured using the Burke Dementia Behavioral Rating Scale (BDBRS) (Haycox, 1984). The BDBRS was designed for clients with dementia and correlates well (r=.61, p=.Ol) with the classic scale developed by Blessed, Tomlinson, and Roth (1968). The BDBRS rates the subject's level of capability, 0 no deficit) to 6 maximal deficit), for categories of language, social interaction, attention, spatial orientation, motor coordination, bowel/bladder habits, eating/nutrition, and dress/grooming. Scores from each category are summed, and total scores can range from 0 to 48, with higher total values representing greater levels of dementia. The level of agitation was measured using the Agitation Behavior Mapping Instrument (ABMI) (Cohen-Mansfield, 1986). This tool is a nonobtrusive assessment used for direct observation and recording of behaviors as they occur in the natural environment. The tool has 19 categories of behaviors under three main classifications: physical aggressive behavior; verbal aggressive behavior; and nonaggressive behavior (CohenMansfield, 1986). Subjects were videotaped for later scoring of agitated behaviors. Check marks were made each time a behavior occurred. In previous studies, inter-observer agreement for each behavior averaged 0.93 (Cohen-Mansfield). The check marks were totaled for each category of agitated behaviors with the higher sum representing increased agitation. Daubenmire's Data Coding Protocol (DDCP) (Daubenmire, White, Heizerling, Ashton, & Searles, 1977) was used to document socialization behaviors for both frequency and duration. Socialization behaviors monitored included verbalization, looks, smiles, leans, tactile contact, praise, physical warmth, and temporal response time. Subjects were videotaped for later scoring by researchers. Check marks were made each time a behavior occurred and were then summed; the higher total value represented increased frequency of socialization episodes. Videotapes were then re-scored for duration of behaviors using a stop watch to time the length of each behavior. Times were then summed with the greater time value representing increased time socializing. Reliability for the DDCP has been established for verbal translation at .93, limb movement at .91, and body movement at .91 (Daubenmire et al., 1977). A trained and certified therapy dog was used for this study. Certification came from the Delta Society's Pet Partners Program. The certified therapy dog for this study was a Labrador Retriever-Golden Retriever mix owned and handled by one of the researchers. Because subjects were unable to provide consent for themselves, consent was obtained from their legally authorized representatives. Assent was obtained from all subjects. Studies were conducted between the hours of 5:00 and 5:30. During each session, subjects were videotaped for 15 seconds every 5 minutes for a total of six observations. The observations took place in the common area of the specialcare unit. Two 30-minute sessions were conducted with or without the dog present. Subjects were free to move about the common area with two researchers present at each session. When the dog was present, one researcher handled the dog; when the dog was absent, the researcher moved around the area without initiating interaction with subjects. The second researcher videotaped both sessions. Videotapes were then coded by two of the researchers. Interrater reliability for selected videotapes for this study was achieved with more than 90% accuracy among the researchers. Purpose 1 was to examine the effect of a therapy dog on agitation and socialization in persons with AD or a related disorder who display behaviors consistent with sundown syndrome. Agitated behaviors were analyzed using an ANOVA-RM to determine the difference in agitation level over time. Dependent t tests were used to compare socialization behaviors between the experimental and control sessions for both duration and frequency. Purpose 2 was to determine if changes in agitation and socialization were related to the level of dementia. Pearson product-moment correlation coefficients were used to determine the relationships between level of dementia and agitation and socialization behaviors for both experimental and control sessions. Researchers performed t tests to determine whether the amount of increased socialization and decreased agitation in the presence of the dog was related to severity of dementia. A ? value of <.05 was accepted for this study. Twenty-eight subjects - 21 women, 7 men - participated in this study. Consent was obtained for 32 persons. One person failed to assent, two persons were absent from the unit at the time of data collection, and one person remained asleep in her room the entire time. All participants were Caucasian with a mean age of 83.8±6.8 years. The mean length of residence on the unit was 17.8±13.5 months. Mean BDRS scores were 22.2±8.3 (range=3 to 37). Subjects were observed to initiate conversation with the dog as well as with the researcher-handler regarding the dog. The subjects' primary diagnoses were as follows: AD (50%); multiinfarct dementia (11%); and organic brain syndrome (7%). Eleven percent had a primary diagnosis other than AD or a related disorder, but all had AD or a related disorder as a secondary diagnosis. Mood and behavior-altering medications were common. The categories and percent of prescribed medications relevant to the study are as follows: antidepressants (32%); antipsychotics (25%); acetylcholine esterase inhibitors (11%); benzodiazapines (25%); and analgesics (18%). The overall occurrence of agitated behavior was low for all observations (Figure 1). The main effect of the presence of the therapy dog was statistically significant and the interaction of the dog and time were not statistically significantly different. Socialization behaviors were coded for both duration (seconds) and frequency of occurrence. Statistically significant differences between sessions were found for leans, smiles, looks toward, tactile contact, and verbalization (Figures 2 and 3). Changes in agitation and socialization when the therapy dog was present were statistically significantly related to level of dementia only for looks. In the absence of the dog, the only statistically significant relationships were for leans toward and tactile. There were no statistically significant differences between subjects with low-level dementia (BDRS score 0 to 21) and subjects with high-level dementia (BDRS score 22 to 48) for agitation and socialization scores. Figure 1 (top): Mean occurrence of agitated behaviors. Figure 2 (middle): Frequency of socialization behaviors. 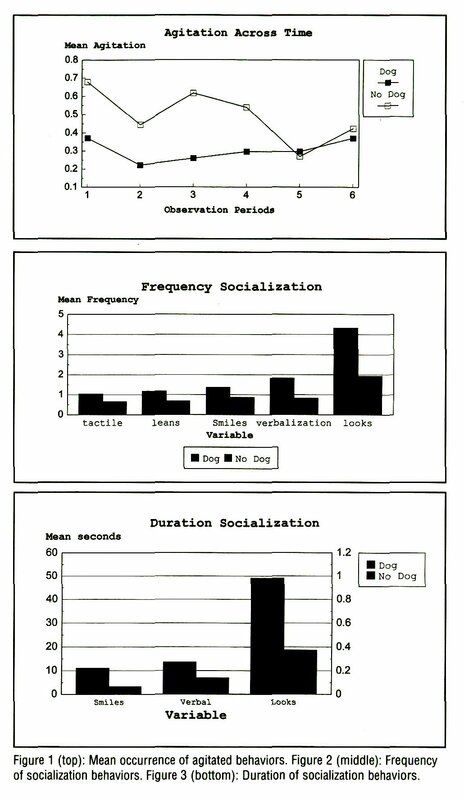 Figure 3 (bottom): Duration of socialization behaviors. The presence of the therapy dog enhanced socialization as shown by increases in verbalizations, smiles, looks, leans, and tactile contact. Looks and smiles may be considered indicators of pleasure and interest, whereas touch has been suggested as an important facet of communication. Touch may fulfill many functions, such as comfort and contact with reality, and has been suggested as a necessary element of mental and physical health (Weiss, 1979). 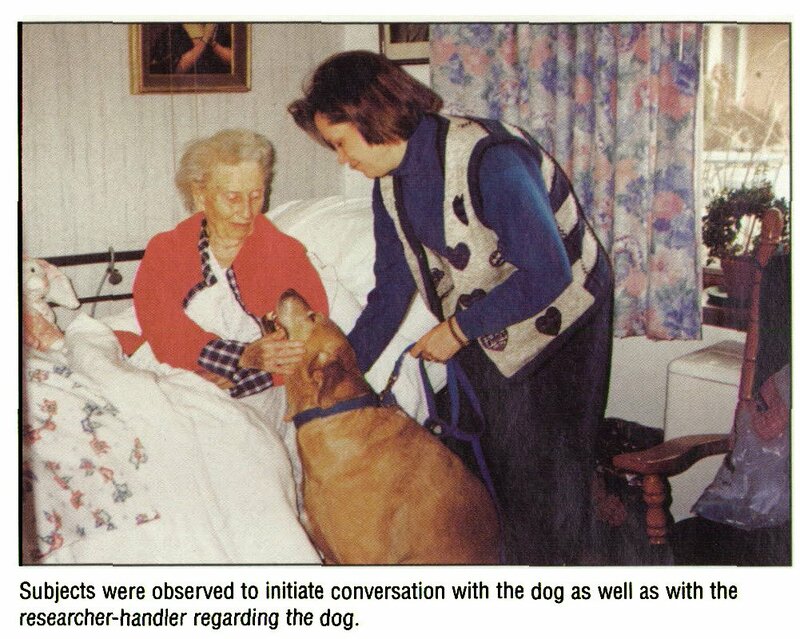 Subjects were observed to initiate conversation with the dog as well as with the researcher-handler regarding the dog. Examples of statements include, "Where have you been all my life?" "I love you," "I missed you," "You're a good doggie." Such statements are consistent with Netting, Wilson, and New's (1987) presumption that pets may allow the elderly opportunities for other roles, such as caregiver, confidant, or companion. This study is similar to that of Batson and colleagues (1998) in that changes in socialization behaviors were examined both in the presence and absence of a therapy dog. The former study focused on the individual person with AD or a related dementia in a controlled environment. The current study focused on groups of subjects in the more natural environment of the special-care unit's common area. Also, the current study added agitation as an outcome variable and limited the time of data collection to the sundown hours. Results were similar to those of the Batson and colleagues' study in that the presence of a dog increased socialization. Although subjects were selected for the study based on identification by the nursing staff of agitated behaviors consistent with sundown syndrome, very few agitated behaviors were observed during the study. Other therapies, namely music and mood and behavior-altering drugs, may have contributed to the low level of agitation. Background music was present during all sessions, and previous studies have shown music to have a calming effect on agitated persons with dementia (Clair & Bernstein, 1991; Cohen-Mansfield, Werner, & Marx, 1988; Gerdner & Swanson, 1993; Goddaer & Abraham, 1994). Several behavior and mood-altering drugs were used by the subject population. Because subjects received the same medications the day of the experimental and control sessions, the medications did not affect differences in behaviors between sessions. The use of these medications, however, probably contributed to the overall low level of agitation that occurred during both sessions. The ABMI was originally developed to observe subjects over an extended period of time with 3-minute observation intervals using a stratified time sampling method covering the 24-hour day (Cohen-Mansfield, Werner & Marx, 1989). The current study used a much smaller interval of time over a shorter, discrete period. This shorter period of observation may not have captured all of the agitation behaviors. Subjects with higher-level dementia did not have differences in agitation and socialization behaviors in the presence or absence of a therapy dog in comparison with subjects with lower-level dementia. Patients with a high level of dementia might be less able to interact socially with other people or a dog because they were less cognitively aware of their environment. The level of dementia did not significantly correlate with increases of socialization and decreases in agitation in the presence of the dog. This might mean that a therapy dog facilitates an appropriate means of communication and functioning for those with greater impairment as well as among those with lesser impairment. The presence of a therapy dog improved socialization and decreased agitation in persons with AD or a related disorder during sundown hours. These changes, however, were found to be unrelated to the severity of dementia. The results of this study indicate that the presence of a therapy dog during the hours surrounding sundown may be a beneficial intervention for affected individuals independent of the severity of dementia. Results of mis study are limited in generalizability to Caucasian persons with AD or a related dementia residing in a special-care unit who have a history of agitation consistent with sundown syndrome. Implications for practice are that a therapy dog could be used as an adjunct to traditional therapies to reduce the occurrence of agitation displayed by persons with AD or a related dementia during the sundown hours. By reducing agitation as well as increasing socialization, people with AD can experience an improved quality of life. Future research might address a more highly agitated subject population. Daily interventions could be instituted to ascertain if long-term benefits could result from the presence of a therapy dog. Alzheimer's Association. (1998). Alzheimer's disease statistics: Fact sheet. Chicago, IL: Author. Batson, K., McCabe. B., Baun. M., & Wilson. C. (1998). The effect of a therapy dog on socialization and physiological indicators of stress in persons diagnosed with Alzheimer's Disease. In CC. Wilson & D.C. Turner (Eds.). Companion animals in human health (pp. 203215). Thousand Oaks, CA: Sage. Baun. M.M., Getting, K., & Bergstrom, N. (1991). Health benefits of companion animals in relation to the physiologic indices of relaxation. Holistic Nursing Practice, 5, 16-23. Blessed. G.. Tomlinson. B.E., & Roth, M. (1968). The association between quantitative measures of dementia and of senile change in the cerebral grey matter of elderly subjects. British Journal of Psychiatry, 114, 797 -811. Clair, A.A.. & Bernstein, B. (1991). The effect of no music, stimulative music and sedative music on agitated behaviors in persons with severe dementia. Unpublished manuscript. Cohen-Mansfield. J. (1986). Guidelines and suggestions for administering the Agitation Behavior Mapping Instrument. Rockville, MD: Research Institute of the Hebrew Home of Greater Washington. Cohen-Mansfield, J., Werner. P., & Marx, M.S. (1988). Should agitated nursing home residents be exposed to either music or television? Unpublished manuscript. Cohen-Mansfield. J., Werner, P.. & Marx, M.S. (1989). An observational study of agitation in agitated nursing home residents. International Psychogeriatrics, 1, 153-165. Daubenmire. J., White, J., Heizerling. K. Ashton. C. & Searles, S. (1977). Synchronics: A notation for the quantitative and qualitative description of presenting behaviors. (Ohio State University Research Foundation RF 760059). Evans, L.K. (1987). Sundown syndrome in institutionalized elderly. American Geriatrics Society. 35. 101-108. Fritz, CL., Farver, T.B., Kass, PH., & Hart, L.A. (1995). Association with companion animals and the expression of noncognitive symptoms in Alzheimer's patients. The Journal of Nervous and Mental Disease, 183, 459-463. Gerdner, L.A., & Swanson, E.A. (1993). Effects of individualized music on confused and agitated elderly patients. Archives of Psychiatric Nursing. 7,284-291. Goddaer, J., & Abraham, LL. (1994). Effects of relaxing music on agitation during meals among nursing home residents with severe cognitive impairment. Archives of Psychiatric Nursing, 8, 150-158. Haycox, J. (1984). A simple reliable clinical behavioral scale for assessing demented patients. Journal of Clinical Psychiatry, 45, 23-24. Kongable. L.M.. Buckwalter. K.C., & Stolley, J.M. (1989). The effects of pet therapy on the social behavior of institutionalized Alzheimer's clients. Archives of Psychiatric Nursing, 1, 191-198. Manor, W. (1991). Alzheimer's patients and their caregivers: The role of the human-animal bond. Holistic Nursing Practice, 5(2), 32-37. Netting, E, Wilson. C, & New, J. (1987). The human-animal bond: Implications for practice. Social Work, 32, 60-64. Paiva, Z. (1990). Sundown syndrome, calming the agitated patient. RN, 53(1), 46-48.50-51. Shapira. J. (1994). Research trends in Alzheimer's disease. Journal of Gerontology Nursing, 20, 4-9. Weiss, S. (1979). The language of touch. Nursing Research, 28, 76-80. Wilson, CC, & Turner, D.C. (Eds.). (1998). Companion animals in human health. Thousand Oaks. CA: Sage.